A local physical therapy clinic in Seattle challenged us to find a way to quickly get more qualified leads from people looking for physical therapy services in Seattle. We accepted the challenge, and got to work! We used a 4-step approach for this physical therapy clinic: (1) Decide which target audience we should reach, (2) Create advertisements that will attract new visitors to the site and garner more leads, (3) make it as easy as possible to call or fill out a form on the website, (4) recapture visitors who had been to the site but hadn’t taken action yet. We looked at Google keyword data and Facebook demographics and found the best keywords and audiences to target for our physical therapist. We found that “physical therapy” was far and away the most valuable keyword to show for on Google, and that people interested in health and physical fitness were our best demographic to shoot for on Facebook. We also found that Google demographics like “Outdoor Enthusiasts” & “Running Enthusiasts” were likely to be interested in physical therapy services, so we included those demographics in our target “pond” as well. Based on the audiences and keywords we chose, we created Facebook ads, Google Search text ads and Google display ads that would appeal to people in the audiences we’d chosen, and show on the sites they spend the most time on and at the times when our client was open for business. The goal here was to be able to drive traffic at a time when our client would be able to quickly respond to inquiries from new patients. After launching the ads, we also monitored them closely and adjusted them on a daily basis to make sure we were getting the best bang for our client’s buck. out a form especially on mobile devices. We created a new mobile optimized page on the website focused on “Schedule an Appointment!” The page encouraged visitors to call or fill out a form, and also included the most important information about the physical therapy clinic in an easy-to-read format so visitors could quickly learn what services the clinic offered and contact them right away. We set up a followup Facebook ad that would only show to people who had visited the therapist’s site before but hadn’t taken action yet: people who have visited the site once from an ad or previous search and choose to visit again are especially likely to call or fill out a form, so we wanted to make sure we got as many of those past visitors back as possible. Our work was a huge success for our client: in fact, we were so successful that they asked us to pause advertising so they wouldn’t be overbooked! 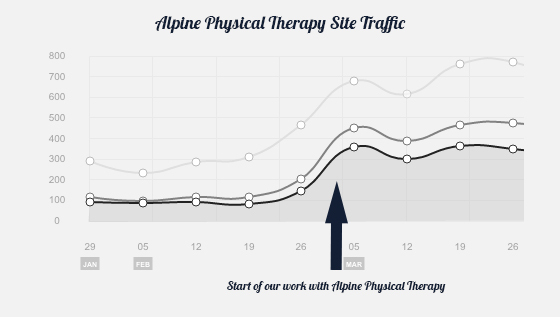 Alpine Physical Therapy's site gained 300% more visitors per week, and those new visitors stayed on the page for over a minute on average (a lifetime in today’s fast-paced market.) This led to more leads and more customers for Alpine!